We are very excited to announce the prize-winner of our very first giveaway! An online random generator picked Pieter from Hartenbos as the receiver of our first prize and we couldn’t wait to email him to tell him the good news. Pieter was quick to respond and told us that he appreciates red wine and is looking forward to trying out his prize bottle. Pieter is a recently retired civil engineer who enjoys DIY projects. He currently has quite a few DIY tasks lined up around the house and as a result enjoys reading about such topics. He particularly enjoyed our informative article on the water saving shower-head as he recently changed all his shower heads in his home to a water-saving type. Thanks for the great feedback, Pieter! And all the best for your water-saving endeavours! Here is a photograph of Pieter in Mapungubwe. He also enjoys nature and nature photography. 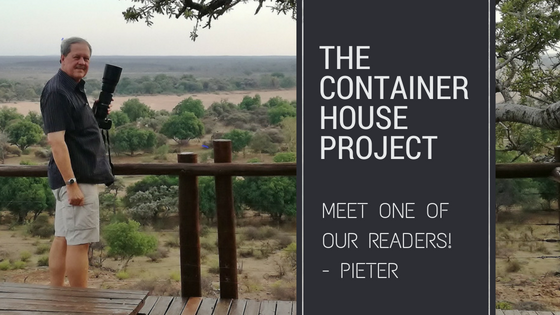 We hope that Pieter and all our other readers continue to enjoy reading and learning from this blog. We are hoping to have a new giveaway for our readers posted soon. If you would like to be notified of our giveaways, you can sign up for our blog notifications right here. We do not share our subscriber’s details with any third parties.